The app lacks OCR capabilities, but that may not matter to users. Box isn’t content with simply storing all your electronic documents, so it’s adding physical documents to the mix as well. Box said Thursday that the company has added document scanning to its Box Capture application for the iPhone, allowing users to take a picture of a document, crop and trim it, and convert the output to a PDF format. After it’s been scanned and converted, the document can be saved to Box’s cloud, or shared to other users. However, Box Capture doesn’t extract readable text from the PDF document via optical character recognition—a task that some competing apps, like Microsoft’s Office Lens, perform. Users also may need to crop the document and adjust the shading, Box said. Why this matters: Box doesn’t appear to be on the cutting edge as far as machine-readable documents are concerned, which may cause some customers to take pause. But given the reach of Box—over 41 million users, as of December—it’s the Box service that’s going to prompt users to download it, not what the app can or can’t do. Anyway, users can always attach comments to documents stored in Box, which is a functional way to get around the app’s current limitation. Box launched Capture last September as a way to compete with other cloud storage services, including Microsoft and Google. At the time, Capture was only able to capture photos. In December, the app added support for audio recordings as well. Box also launched what it called Platform in October, allowing third-party applications to connect to and leverage the Box cloud service. 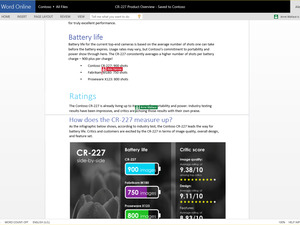 Though Office Lens and Capture are nominal competitors, the two companies have launched a dedicated Windows 10 app, leveraging Platform. Box has positioned itself as a service for the business user, however, and documents scanned by Capture reflect that. Each document that’s scanned using the Box Capture app is not stored on the user’s camera role for security’s sake. Instead, it’s directly uploaded to the Box cloud. Box also touted the deep integration its app has with others, like Salesforce and DocuSign, and said that each file that’s uploaded can be controlled via granular permissions, then assigned via a tasks function to other coworkers.